I’m spending the day with a fantastic group of artists, youth organisation representatives, researchers and arts experts for a workshop at the Scottish National Portrait Gallery, aiming to collaboratively explore and develop ideas for a project to explore the potential of contemporary art to raise awareness, provoke thought and motivate change in relation to youth inequalities. I’ll post some notes and other materials later, but we’ll be using the hashtag #artineq. The other organisers of the event are Marlies Kustatscher and Alan Brown. This year I was delighted to have been appointed a Scottish Parliament Fellow by the Beltane Public Engagement Network. This meant I got to spend a day a week in the Scottish Parliament over a roughly six-month period. I really can’t say enough good things about my experience as a Fellow, working closely with Donald Jarvie and Scotland’s Futures Forum. 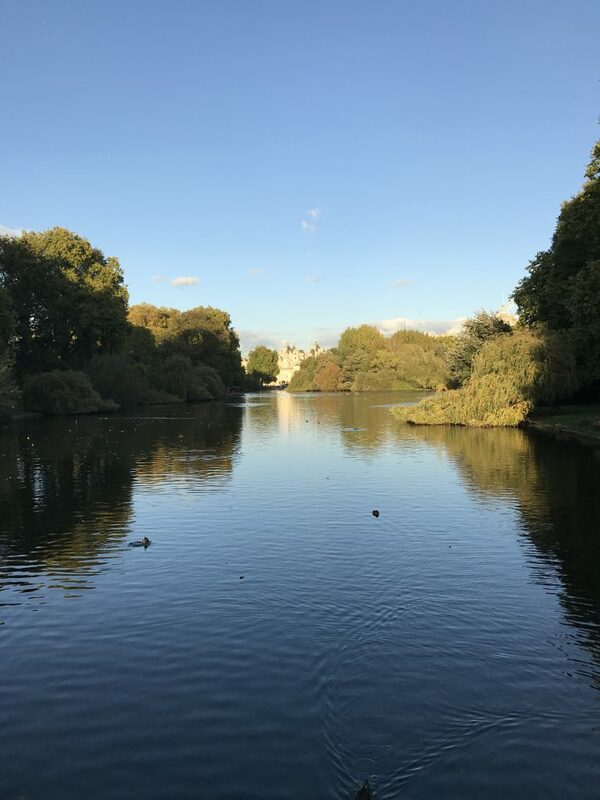 My understanding of public engagement, the policy sphere in Scotland, and the value of networking and collaborating beyond academia has been deepened, and it’s really had a big impact on how I think about my identity and priorities as an academic. My Fellowship focused on online and distance learning in Scotland, and looked in particular at issues around Massive Online Open Courses. I briefed Parliament colleagues about MOOCs, co-ordinated resources and activities to get them to explore these courses by signing up for one in early 2014, and worked with the Forum and the Learning and Leadership team to embed MOOCs as part of the professional development infrastructure of the Parliament. 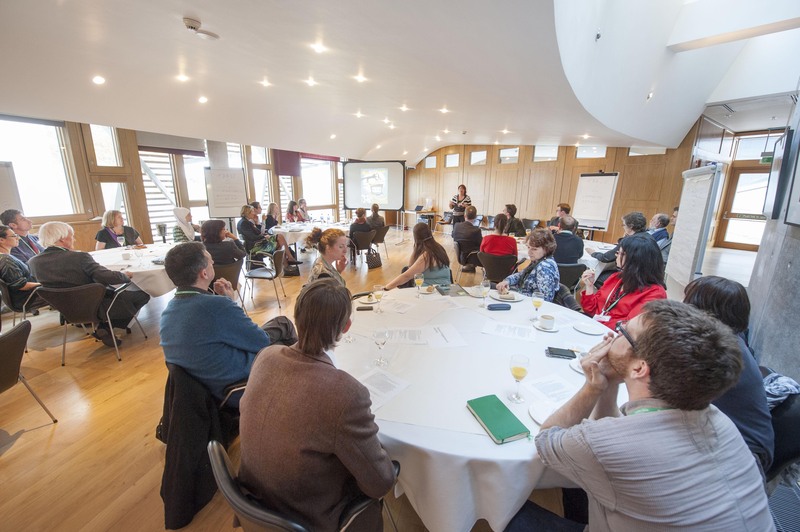 The MOOC strand culminated in a workshop in April 2014, bringing together groups of non-academic experts in four topic areas, including wellbeing and community energy, along with MOOC experts from the University of Edinburgh, to discuss the potential for creating MOOCs for public engagement and knowledge exchange. These teams are now taking their ideas forward, with further input from me. Two other strands of activity emerged during the Fellowship. The first involved discussions with the Shetland Learning Partnership, when Scotland’s Futures Forum was asked to help plan scenarios for secondary, further, higher and adult education in Shetland. 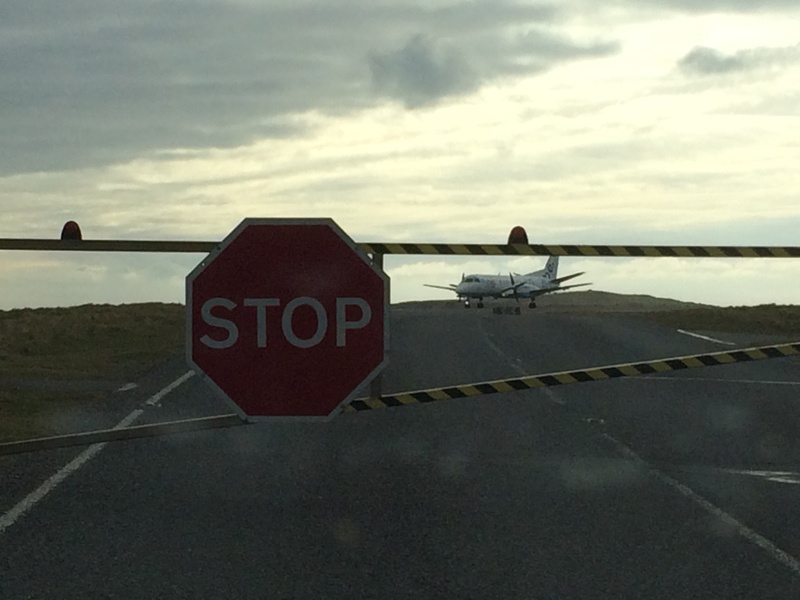 One of the sights of Shetland – in the taxi, stopped at the runway’s level crossing to wait for a plane to take off! The second was a collaboration with the Forum to host a ‘Creative Futures for Scotland’ roundtable event exploring how the growing popularity of individual and collaborative creativity (for example, crafting, 3D printing and web coding) could impact on learning, innovation and wellbeing in Scotland. 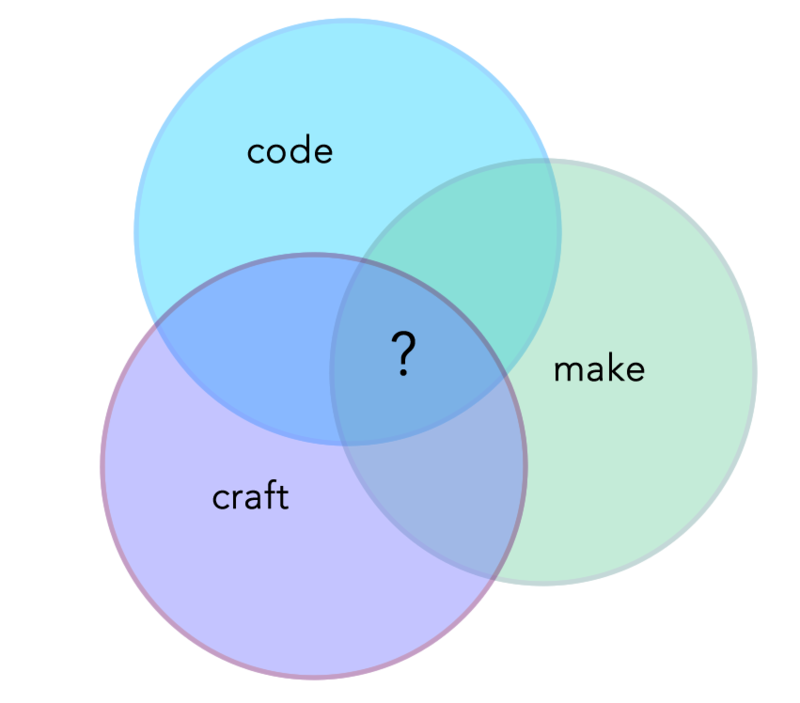 My question about Scotland’s creative futures. All three areas of work are continuing beyond the end of the Fellowship. I greatly appreciate the support I’ve received from Beltane, Scotland’s Futures Forum and the University of Edinburgh. Next week I’m fortunate to be involved with two digital education conferences, and wanted to post about them both, because they’re both very dear to me. From Monday 7th, my colleagues and I are proud to be the local hosts of the Networked Learning conference in Edinburgh. This is, in my opinion, the best conference for hearing about new approaches to networked/digital/online education theory. This year the keynotes (from Neil Selwyn and Steve Fuller), symposia, and papers look outstanding. I’m missing my own symposium on Wednesday, on ‘the spaces of networked learning‘ which is upsetting, because it’s going to be amazing. But Phil Sheail, my paper co-author, is planning an excellent short talk based on our paper: Disrupting the illusion of sameness: the importance of making place visible in online learning. The reason I’m missing it is because I’m heading to Dallas, USA, for my third year of Sloan-C’s Emerging Technologies for Online Learning. I have this conference to thank for introducing me to some wonderful collaborators, including Amy Collier, with whom I’m giving a plenary talk on Friday morning: Mess in Online Education – How it is, how it should be. I’m also getting the opportunity to think about my career (! ), as I join a panel discussion about ‘the role of faculty and professors in educational technology’. So – an eventful week, the end of which will find me with my dear sister, the other Dr Ross, exploring the sights of DC. I’m promised cherry blossoms. If we’re overlapping next week in Edinburgh or Dallas, I look forward to seeing you! I’m heading to Las Vegas today for the Sloan-C Emerging Technologies for Online Learning conference. I’ve been invited to run an unconference workshop for making a manifesto, which will be great fun, and a fantastic opportunity to build on what we learned in developing our manifesto for teaching online. The unconference is happening on Friday afternoon, 12:30-3:30pm (EST). Along with the details on the conference site, there’s also a Google+ unconference page with the latest news. Conference participants are all invited to attend – virtually or face-to-face. Once I get to Vegas, I’ll be spending my time meeting people and attending sessions, of course, but also chatting to people about teaching with emerging technologies, and what it means to be, or have, a teacher in these new contexts. If you’re at the conference, and have something to say about that, tweet me (@jar), message the unconference page (+et4ol unconference) or find me in person! For the benefit of those who weren’t able to be there (and for my own use later), I liveblogged John Urry’s talk at the ProPEL conference in Stirling on 10 May 2012. 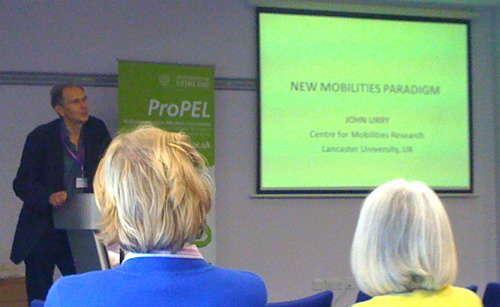 New Mobilities Paradim, John Urry, Centre for Mobilities Research at Lancaster University. John’s work has been about trying to mobilise the social sciences and develop a mobilities turn, to draw out how so many aspects of social life presuppose intermittent mobilities. However, some of the empirical processes involved are problematic – will mobility as we understand it continue forever, or is it of a specific moment? Tolstoy on “other contrivances” for transporting people – but “never able to commit anything but evil” in the process. In 1800 people people in the US travelled 50 metres a day, by foot, horse and carriage. Now they travel 50km a day, mostly by car and air. But distance does not necessarily = time – a bit more than an hour a day gets you further than it used to. World citizens move 23 billion km each year. This may quadruple by 2050. 1839-41 – new and interdependent systems came into play, mainly in England and Scotland: telegram; national post; first railway age; first package tour (Thomas Cook); first Baedeker guide; first scheduled ocean steamship service; invention of photography. Forms of mass movement – not just technical, but coming together in a system. Systemness is particularly striking. A shift in the way in which environments were understood and experiences as land –> landscape (influenced by the tourist gaze). The pleasures and uses of movement are interestingly interlinked. 1. all social relationships involve diverse ‘connections’, some at a distance. 2. these stem from five interdependent ‘mobilities’: corporeal travel of people; movement of objects; imaginative travel; virtual travel; communicative travel (telephones, SMS, letters, etc.). These different forms of movement intersect. 3. physical travel involves lumpy, fragile, aged, gendered, racialised bodies. 4. on occasions and for specific periods of time face-to-face connections are made. There is still something significant about this. Five processes generate face-to-faceness: legal, formal obligations to attend; social obligations to meet and converse, often involving strong expectations of presence and attention (Goffman); obligations for co-presence to sign contracts, work on or with objects, written or visual texts; obligations to be in and experience a place directly; obligations to experience a live event. 5. many kinds of social practices that presuppose movement. 13. mobilities presuppose ‘immobilities’. Some people have to be immobile so other people can move around. See journal “Mobilities” for examples of taking up and elaborations of these characteristics. People’s lives are more spread out, so scheduled visits and meetings become more important (and meetings about meetings about meetings; a whole technology of meetings, diaries, calendars). Proliferation of locations, tech and systems to facilitate meetings. Social networks are accomplishments, in process, weaving together material and social. People are traveling further to accomplish their meetings. Relational commitments are crucial to travel choices. The greater the distances traveled, the longer the meetings will last. Overall, “friendship miles” “family miles” “business miles” and so on become necessary in order to be a *good* social actor. These set up really strong obligations – “the gift of travel time” that shows your commitment to the people/group in question. Zygmunt Bauman: “Mobility climbs to the rank of the uppermost among coveted values” – stratifying factor (Liquid Modernity) –> leads to the concept of “Network Capital” (Urry). In order to be good at networking, that presupposes an array of material and other resources, people to visit, movement capacities, ability to locate information, meeting places (including places en route), communication devices, time to manage and co-ordinate (especially when things go wrong). There is a large array of mobilities (many modalities) – much more complicated than govt statistics (business vs leisure) would indicate. So: what are the future challenges for mobilities? 3 issues: Oil; climate change; China. These issues will be transformative of mobility systems. OIL: Almost all mobility systems are dependent on one resource. 95% of transportation energy is oil-based. “almost free” resource transformed the US. Oil uniquely makes possible our mobilities. It also has made possible the movement of goods and the manufacture of goods (including food); heating. And it is running out. Continued growth of mobility processes becomes much more complicated. CLIMATE CHANGE: increases in temperature make mobility systems more complicated and increase costs. But is a reversal underway? A modest decline in US vehicle miles travelled in 2008. 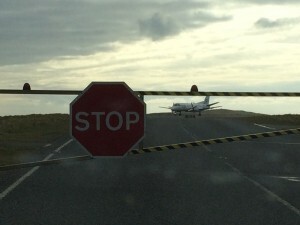 “Peak travel” – long term continued increase in scale and rate of movement may not continue forever. Are lots of things peaking? eg: young people in western countries are less likely than previously to have a driving license or own a car. A remark: If US citizens wouldn’t buy so many military style vehicles, the wouldn’t depend on oil imports… why do people want to drive these things? John: the US system has been characterised (by George Bush) as ‘addicted’ to a particular lifestyle. Disagrees that oil import would be eliminated in this way, though. But the data about young people is interesting – this is not their ambition – maybe a tipping point. But in China the tipping point is going the other way – large vehicles are particularly desired. Question: Latour discussed how geologists have named our time ‘anthropocene’ – instead of being concerned with the post-human, we should be concerned with post-nature. What implications does this have for our research strategies? John: originally this term was to do with the use and extraction of fossil fuels. The significance of energy for social thought and theory has not been explored enough (but special issue of Theory, Culture and Society addressess this). The rise of the west was dependent on fuel – ‘societies beyond oil’ – we need to think about what comes after… maybe it’s nothing.